Vahtacen was an Ayleid settlement located at the swampy headwaters of the Reed River in the Nibenay Basin, south of Cheydinhal. It was the home of the Vahtache, an Ayleid faction. 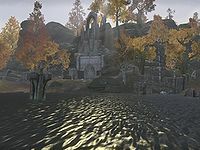 In the Hosiric Lays, songs that date back to the Ayleid Empire, the "waving fronds of Vahtacen" are briefly mentioned. This gives credence to the belief that Cyrodiil possessed a subtropical climate during the time of the Ayleids. During the Alessian Slave Rebellion, Pelinal Whitestrake knocked down the doors of Vahtacen to free the prisoners of the Vahtache, while Alessia and Morihaus flew overhead. It was after this event that Alessia was called "Al-Esh" ("High Highness") for the first time. After the rebellion, the settlement fell into ruin and was gradually lost beneath the earth. During the time of the Planemeld, Vahtacen's exterior was still clearly visible, although much of it had been covered by the waters of the Reed. The ruins swarmed with undead, led by a powerful Lich known as the Faceless. In 2E 582, the ruins were within the territory controlled by the invading Ebonheart Pact. The nearby Harlun's Outpost overlooking the ruins was a point of contention during the Alliance War, with all three sides struggling for control of the structure. An Ayleid relic was recovered from Vahtacen for Vyctoria Girien of Cheydinhal that year, and the Faceless was destroyed. Circa 3E 433, the Mages Guild began excavating the ruins, breaking through into the top level from a natural cave. The excavation was headed by Irlav Jarol, an expert scholar of the Ayleids, although he wasn't involved in the on-site work. The excavation's progress was halted when several mages were injured by an enchanted pillar which reacted to magic. 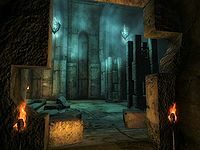 By translating several inscriptions, the mages discovered the correct order in which spells must be cast at the pillar, and in doing so revealed an entrance into the lower undead-infested level of the ruins. An ancient Ayleid helm of some significance was discovered within the ruins. This page was last modified on 21 January 2019, at 23:54.